The year is 1965. The place is Oxford, England. A student from a girl's academy failed to show up for classes after the weekend. Mary Tremlett (Rachael Heaton), the missing 15-year-old girl, was thought to have gone out with her friend Valerie Quillen (Holly Ridley) to a movie, But Valerie later told police that Mary never made any such arrangements. A missing persons search of the surrounding area by the police was organized. Detective constables from other stations were bused in to supplement the incident team. Among them was a young DC Endeavour Morse (Shaun Evans). A disillusioned Morse had just typed up his resignation letter from the police when he and his colleagues were hurried off to join the search for Mary Tremlett. Immediately on arriving, Morse confronted the reality of a major police operation in the person of the cynical, stern, and condescending Detective Sergeant Arthur Lott (Danny Webb). He was relegated to the unglamorous duties of a junior clerk such as passing out flyers of the missing girl. DS Lott had a low opinion of the policing skills of the young DCs in his care. When it was discovered that Morse had attended St. John's College in Oxford and knew the area, he was reassigned to conduct interviews. This put Morse on DS Lott's bad side, who resented privileged boys who could afford to attend college and not have to do real work. When an apparent suicide was reported, Lott assigned Morse to oversee the crime scene to get Morse away from the main job of finding Mary Tremlett. To the surprise of the senior investigating officer, Detective Inspector Fred Thursday (Roger Allam), the young DC Morse had a natural talent as a detective. From finding the first edition books of poetry and cross-words in Mary Tremlett's room, Morse had a good guess where Mary was headed the day she was last seen. Shortly after, Mary Tremlett's body was indeed found in the woods Morse had mentioned. Roger Allam and Shaun Evans have chemistry on screen. Shaun Evan's performance strikes the right balance of being one step ahead of his plodding police colleagues, an arrogant sense of being superior yet emotionally insecure. True to the mature Morse, the young DC Morse has issues with authority. But under the fatherly guidance of DI Thursday, the young Morse finds the mentor he failed to find at Oxford or the Army. But Morse loses his innocence. He personally learns the painful lesson that beauty is not truth. 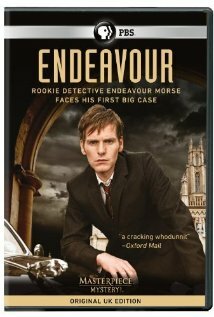 I highly recommend Endeavour to fans of British police procedurals in general and fans of Inspector Morse in particular. The writer and film makers have done their homework and presented a credible story of Morse's first murder case. The production values are excellent and capture the time period. Shot on location at Oxford, England, the medieval University lends a brooding presence. The prejudices between town and gown, upper class and working class are evident everywhere, even in the police force. Music is by Barrington Pheloung, who did the music for the original Inspector Morse TV series. That plus opera, cross-words, and a pint is enough to satisfy die-hard Inspector Morse fans. To read another review of this movie, please click here. Copyright © 2012 Over My Dead Body! All rights reserved. Reproduction in whole or in part in any form or medium without express written permission of Over My Dead Body! is prohibited. OMDB! and OMDB! logos are trademarks of Over My Dead Body!